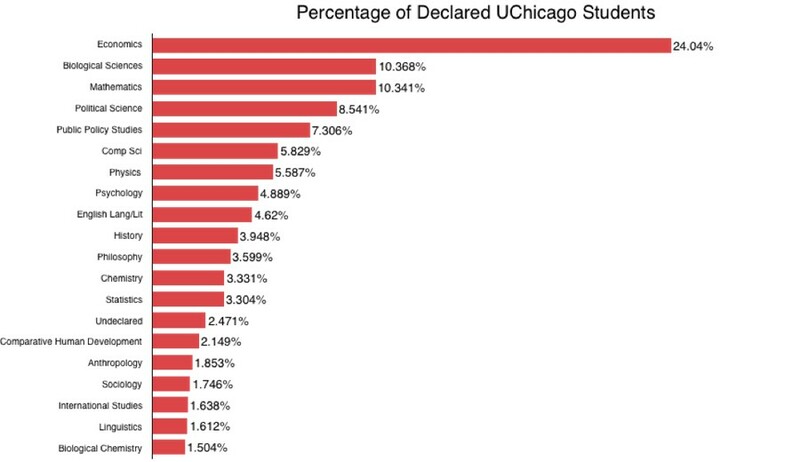 If you take two random undergraduate students who have declared a major at UChicago, you would expect that at least one of them is majoring in Economics, Biology, Math, or Political Science. Collectively, these four majors are almost as popular as the remaining 55 majors combined. This graph counts all students in the College except those declared as Common Year*. For reference, 3,723 people have declared a major. There are 59 possible majors to declare according to the Registrar (one of which, however, is “Undeclared”). 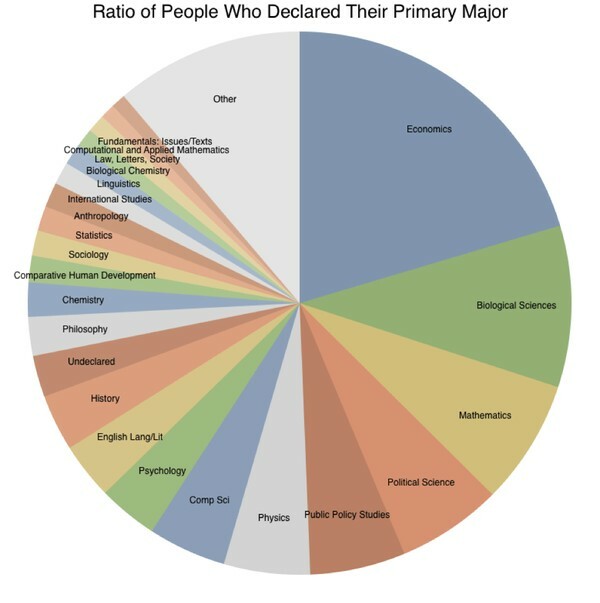 This graph shows the proportion of students that listed a major as their primary major. At UChicago, students can declare multiple majors, but choose one as their primary major. This is the major that is written on a student’s diploma. Economics was listed as the primary major for 20.3 percent of students. Biological sciences follows with 9.62 percent. The next most common majors are math (7.44 percent), political science (6.26 percent), and public policy studies (5.67 percent). Only considering majors with more than 30 students, on average a major has roughly 74 percent of its students declare it as their primary major. However, 92.8 percent of biological science majors have it listing as their primary major. Physics is similar, with 91.8 percent of students listing it as their primary major. Ninety one point four percent of the fundamentals students listed it as their primary major. Conversely, only 55 out of 123 students majoring in statistics, or 44.7 percent, declared the subject as their primary major. Similarly, of the 33 East Asian languages and civilizations majors, only 16, or 48.5 percent, declared it their primary major. Of the 45 people declared as romance languages and literatures majors, only 15, or 33.33 percent, declared it as their primary major, the lowest number of any major. be found here. This data represents the student population in Spring 2016.